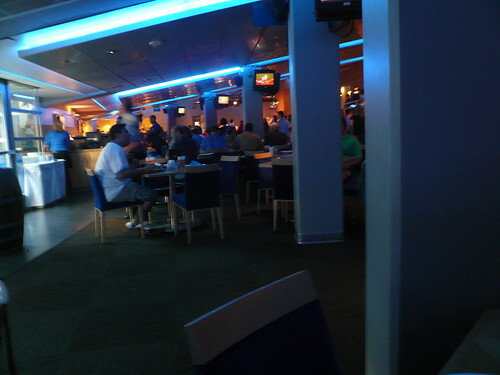 Went to the Dodgers game last week, and got to go to the famed Dugout Club. 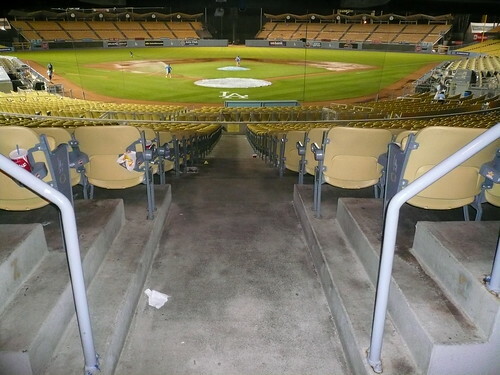 These are the crazy expensive seats that the Dodgers built for the likes of Larry King, Pat Sajak, Josh Brolin, and me? Of course I’m not high faluting enough to own these tickets, but it’s the perks of having the privilege of paying high priced lawyers negotiate your contracts. A couple of things about the Dugout Club. The first rule about Dugout Club is you do not talk about the Dugout Club. Seriously. This is the all you can eat pavilion for the gentried elite. Huge buffet, free all game long. Free peanuts. Free ice cream. Free hot dogs. Everything is free except for liquor. When we showed up at the stadium, we looked at the tix and proceeded to walk to the correct row and section. But there is a moat-like separation between the Dugout Club and the common fan. 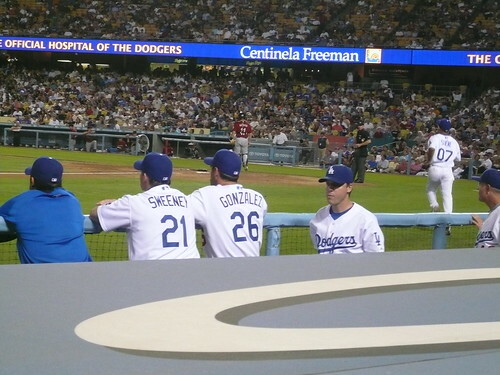 We went to see where the seats were and they were right behind the Dodgers home dugout by third base. Front row. Overall it was quite a trip. Discussed IP law and cases with my attorney, made a few business contacts, and ate a few Dodger Dogs. After the game we retired to the bar behind the buffet and had a drink. It was a pretty eclectic scene. As we walked out the the empty parking lot, my friend said he wanted to do donuts. We laughed, and then drove sensibly to the exit. But when we got there it was locked. So with no one around, we got a little loose in Chavez Ravine. And then we kept going, searching for an open exit. We must have gotten a half dozen donuts at various locked exits before we found a path to freedom. Man, that’s sounds familiar, and your attorneys sound cool. I’ll bet one of them owns a bimmer and did donots too. Actually, I’m sure about that last part. perks are good when you get ’em. Whats “IP”? I’m guessing IP stands for “Intellectual Property”. Eh. I don’t buy it. I don’t think Kent stayed til they cleaned up after the game. More likely he was there to clean up after the game. 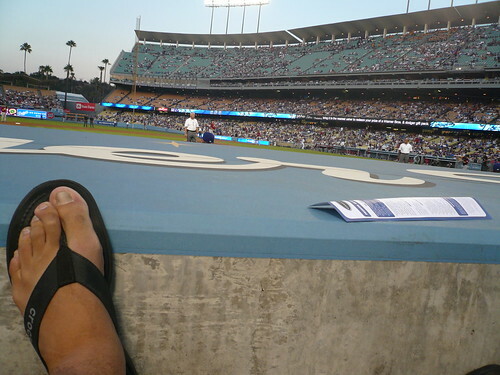 I mean, really, who wears sandals to watch baseball? David is right on this one. Funny how there’s no one around in Kent’s self-photo, and why would he take a picture of his own foot instead? Must have had a clean-up gig and got there a little early. And he has no lawyer, so he’s making the whole thing up for sure. IF he had a lawyer, the lawyer wouldn’t be caught dead with such a grubby client unless he was really rich and famous. And Kent knows he’s not rich and famous. He’s a blogger. The exit behind the stadium down Elysian Park to Sunset Blvd is the last one to close, and the first one to open for employee’s and other late/early arrivers. 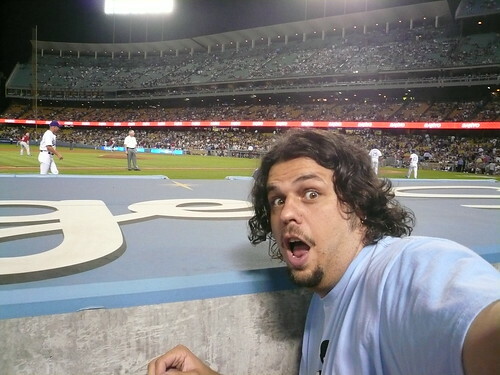 I had the great pleasure of attending a Dodger game with friends who had procured a set of *free* Dugout Club seat tickets from their employer at [insert big name entertainment company here]. It was truly a memorable experience. Best seats I’ve ever had a MLB game…not to mention all the free food and drinks. The only thing I had to pay for was parking.